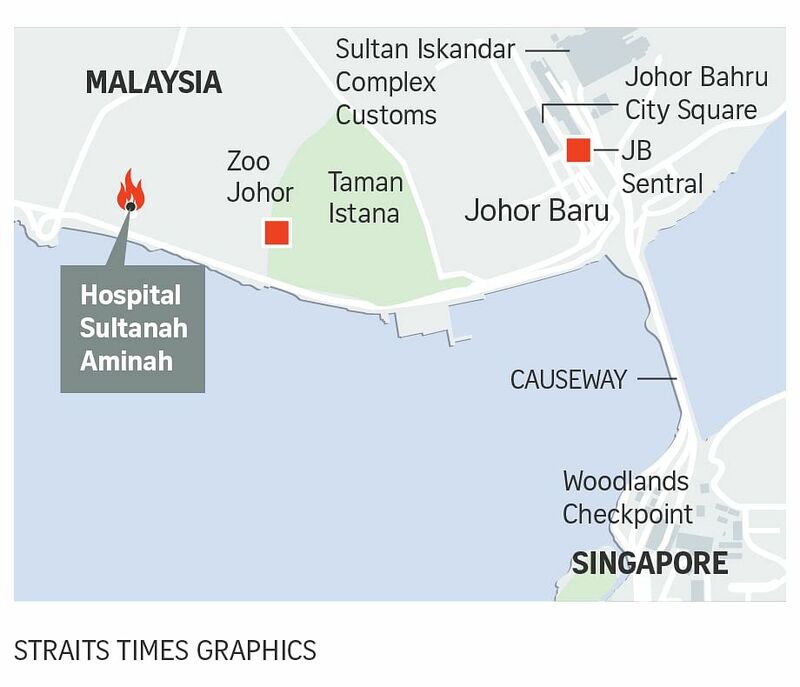 JOHOR BARU (THE STAR/ASIA NEWS NETWORK, AFP) - Six patients have been killed in a fire that broke out at the intensive care unit (ICU) of the Sultanah Aminah Hospital in Johor Baru. Many of the patients were evacuated to other wards after the fire broke out at the building's top floor at 9am on Tuesday (Oct 25). Johor Baru (South) police district chief, Asst Comm Sulaiman Salleh, said the victims were all patients warded at the ICU, located on the second floor of the hospital's main building. The Fire and Rescue Department confirmed in a tweet that seven people had been trapped in the building, and that six of those had perished in the blaze. One person was successfully rescued. Of the victims, four were female and two were male. The four women have been identified only as Ms Cho Lin Feng, Ms Poh Ah Wah, Ms Kaliama and Ms Meramaladeri, while the two men are identified as Mr Logaswaran and Mr Yusof Hasan. All the victims were in their 50s. Asst Comm Sulaiman also confirmed that the one person rescued, identified only as Suppamah, was warded at the ICU when the fire broke out, and suffered 80 per cent burns on his body, while hospital staff member Nurul Ain sustained serious injuries. He said there were eight staff and seven patients in the ICU when the fire broke out. “We believe that all the victims died due to suffocation caused by the thick smoke in the ward,” he said at the scene. Malaysian Prime Minister Najib Razak said the government would conduct a thorough investigation into the fire. “The Government will conduct a thorough investigation as soon as possible to identify the cause of the fire and the safety level (at the hospital),” Datuk Seri Najib Razak said in a tweet. Mr Najib also expressed his condolences to the families of the victims who were killed during the incident. He said that the Health Ministry, the Fire and Rescue Department and police are currently managing the situation at the hospital. Health Minister S. Subramaniam said he was deeply saddened by the news. “The Ministry of Health has taken all necessary rescue actions and precautions to safeguard the rest of the patients and staff, including evacuating them to ensure their safety. “The cause of the fire is still under investigation and all relevant agencies are working together to keep the situation under control,” Datuk Subramaniam said in a statement on Tuesday. He confirmed that six patients were killed in the fire, adding that another patient has been transferred to the burn unit at Sultan Ismail Hospital. “Ten of our staff were also injured, and two of them have been transferred to a nearby hospital for treatment. “On behalf of the Health Ministry, we would like to offer our deepest condolences,” he added. Photographs posted on Facebook by the Health Ministry’s director-general Noor Hisham Abdullah showed black smoke billowing from the hospital’s second floor and fire raging inside the building. “I have been informed that there are victims due to the fire including patients and staff. A sad day for all of us,” he said in an SMS message to Agence France-Presse. Mr Noor Hisham also said one patient and two hospital staff are in critical condition due to smoke inhalation injuries and burns. Asst Comm Sulaiman said that there were 193 staff and 294 patients at the hospital at the time of the incident. It is understood that patients in the maternity ward, including some who had just given birth, were evacuated safely. Johor Fire and Rescue Department director Othman Abdullah said that the department received a distress call at 8.56am. “We deployed 10 fire engines with 160 personnel from Johor Baru, Tebrau, Kulai, and Johor Jaya fire stations to the scene. The fire affected two floors of the main HSA building but we managed to stop it from spreading to other floors,” he said.